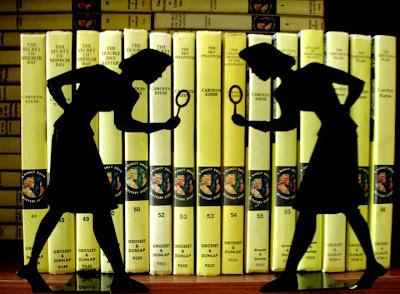 Books play a big part in many of our homes - which is why I alternate between providing advice on how to dispose of those you no longer need, and providing information on how to store the keepers. For now, let's look at those keepers - and some bookends that might help. 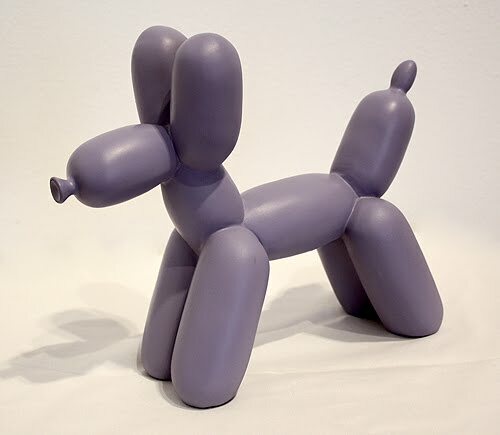 The balloon dog bookends were designed by Imm Living and are sold by Park Life, among others. They are also the subject of a legal controversy involving Jeff Kooms, as explained in The Bay Citizen. 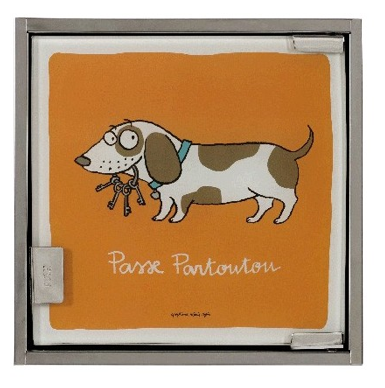 The bookend is made of cast resin and weighd 6 pounds; it's available in perkwinkle and orange. 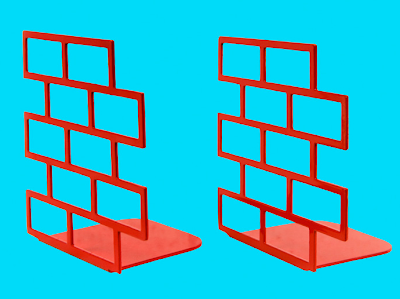 These stacked brick bookends come from Gluekit; they are also sold by Supermarket, where I first found them. Those of us who grew up reading Nancy Drew books might like these Nancy Drew Silhouette Bookends. Update on Nov. 20, 2105: The site that sold these no longer does so, and I haven't found another source. 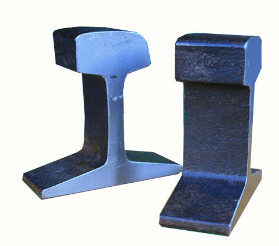 If you want bookends with a lot of heft - and you don't mind spending a lot of money - you can get these mid-century solid steel rail track bookends. Update on June 8, 2011: The site that was selling these no longer carries them, although I found what looks to be the same thing on an auction site. 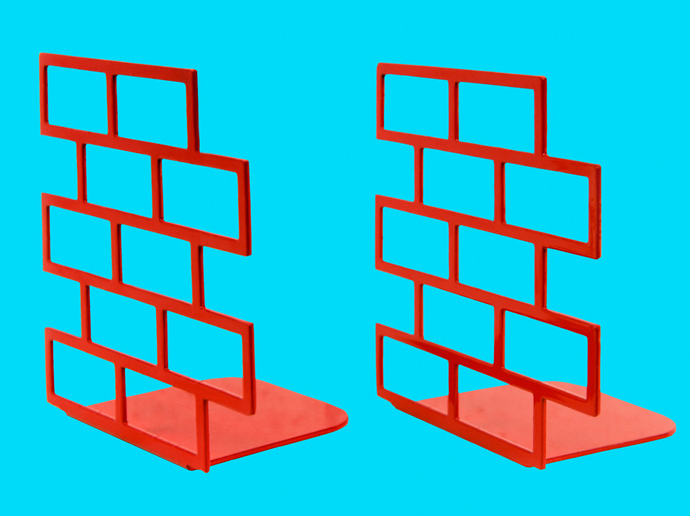 And finally, take a look at these reclaimed stiletto bookends! Our organizing needs change over time - so modular storage that provides flexibility in the configuration can be a real help. 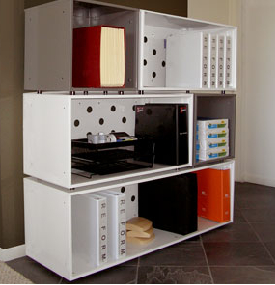 And sometimes we have to fit storage into a strangely-shaped space - and modular options can help with that, too. Let's start our tour of some options with one of the more amazing ones: More, from Studio Caporaso. Take a look at the Caporaso web site to see some of the many ways the basic cubes can be combined - you don't have to send them off at weird angles! If you live in the U.S., I have options for you, too. 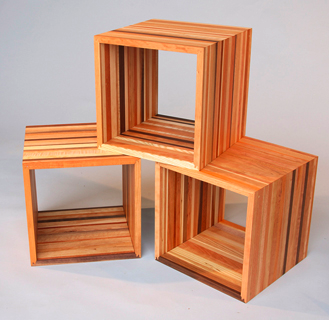 Here are the Suzy Cubes from Hardwood Artisans - available in a single wood, or in this striped look. Levenger has its BookBoxes. Update on Aug. 31, 2013: Levenger doesn't see these any more. Boltz has modular steel bookcases. 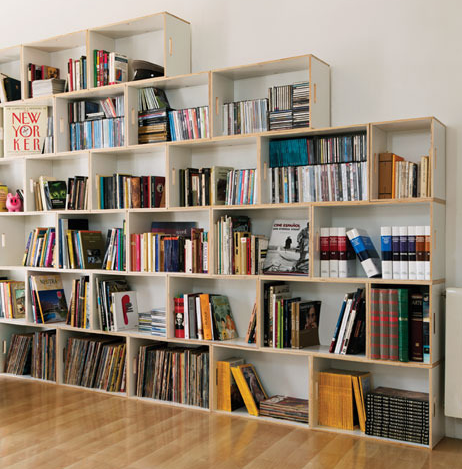 Reform has its Ferris Shelving, also made of steel. 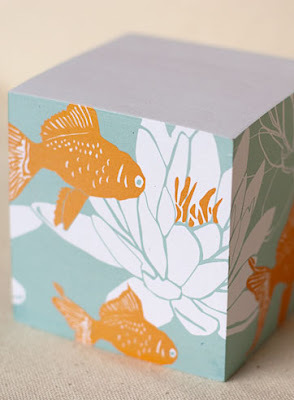 Each cube is available in one of eight colors, and your choice of perforated backs or not. Glass doors are also available. 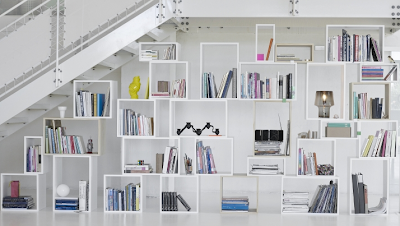 And I just realized that while I've mentioned Smart Furniture before, I've never specifically mentioned its Smart Shelves. 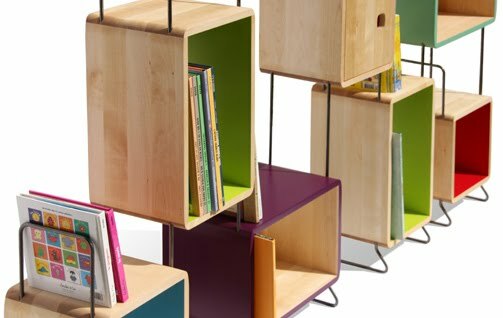 I'm very fond of Smart Furniture, because I recently bought my Herman Miller Scooter Stand there - and got amazing customer service. My December 2010 / January 2011 newsletter is now available. 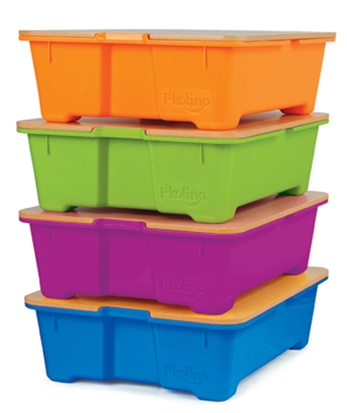 Product of the Month: P'Kolino Play Kits, sold (among other places) at The Shelving Store. I'm wondering if you've done any research on mailboxes. 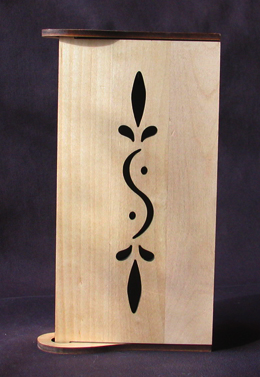 I'm looking for something large enough to hold a few days mail, but that's also attractive and not a custom order. So many of the ones I've seen are ugly. 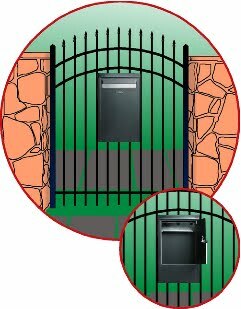 Now to push it a little further, I'd love to find a box that works on a fence or a gate so that the public/street side is a mail slot and the private side has a secure box to hold the mail with the ability to take the mail out on the private side of the fence. This message arrived a couple days after I read about the issue of "protecting mail from identity thieves." 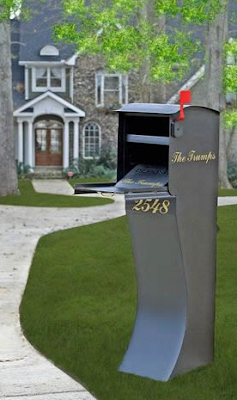 [Thanks to Naomi Seldin] So let's look at mailboxes that are secure and at least somewhat attractive - including some that might work for the reader. 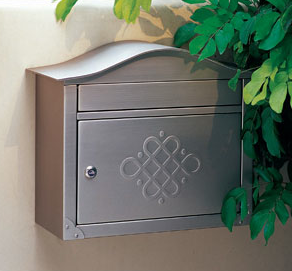 The Bobi mailbox shown above can be wall-mounted or curbside mounted. It comes in six colors - a bunch of neutrals, and red. But two models (the Classic-B and the Grande-B) have rear doors, and they are shown mounted to a gate. 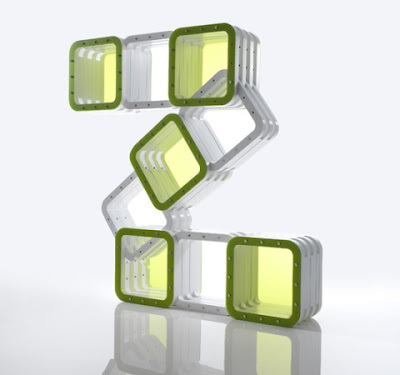 They are made of "stainless steel or zincplated steel which is covered with a polyester coating." 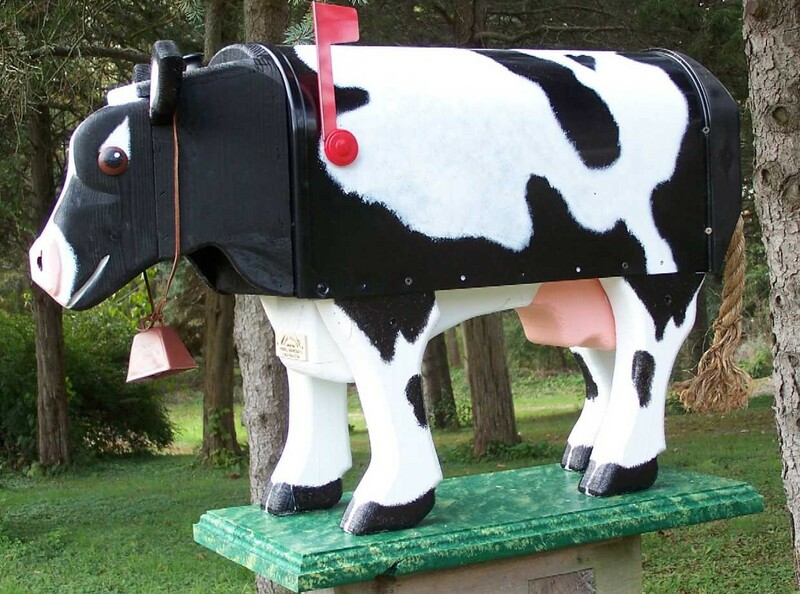 The mailboxes are made in Finland, but they're available in at least 15 countries: much of Europe, as well as the U.S., Canada and Japan. Another option is the Janzer thru-fence mailbox - but unfortunately, this is the only picture on the Janzer web site. 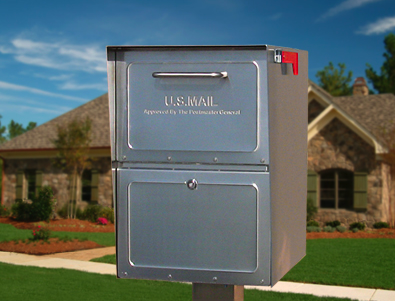 The mailbox is made of aluminum. Update on Sept. 8, 2018: It seems that Janzer no longer makes this mailbox. 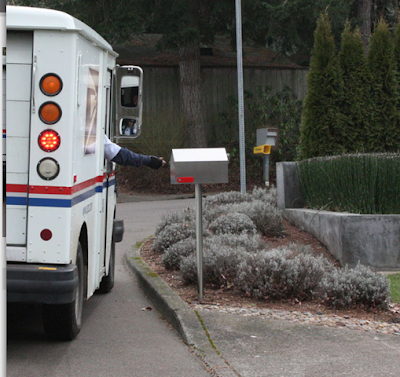 The MailCase is a more traditional post-mounted option - and doesn't have a rear door. 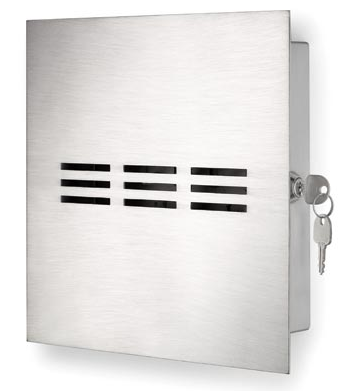 And for those of us who need a simple wall-mounted option, the Peninsula locking mailbox from Architectural Mailboxes is quite nice; it's stainless steel. 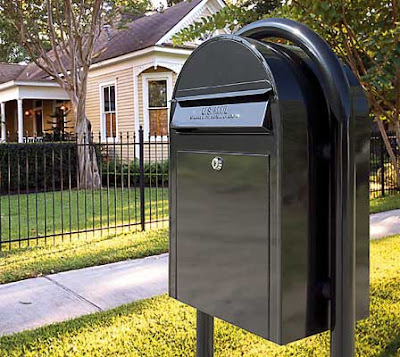 The company also makes other locking mailboxes, including post-mounted ones. 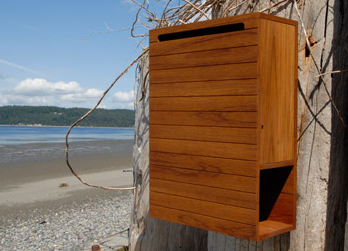 And if you have a sheltered location for your mailbox (and a lot of money to spend), you could get this teak mailbox from Semigood Design, handcrafted in Seattle. Both locking and non-locking versions are available. 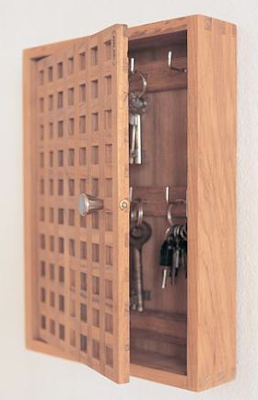 Have you blogged about fancy key cabinets? No, but I'm glad to do so now! Many of the nicest ones I found came from Europe, including this avainkaapit from Veico, in Finland. (I'm so thankful for online translation tools!) There are 10 different designs, including one with an elk. Moving over to Denmark, we've got the nautic key box from Skagerak, also sold by Salcombe Trading in the U.K.
Over in France, Derrière la porte provides this armoire à clés - and here's another design. 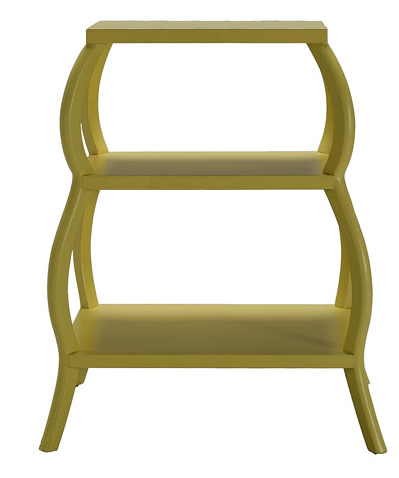 The Schlüsselkasten from HAKU isn't fancy - but it you want something simple with a bit of color, it's ideal. You can also find it in the U.K. Speaking of the U.K., I've already blogged about the amazing key cabinet from the Edward Barnsley Workshop. 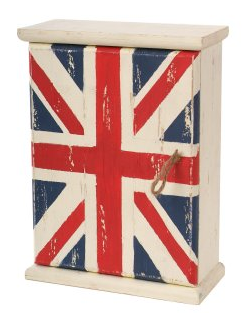 Here's a very different one - the Union Jack key box. Blomus is a German company, but its products - including this key box - are widely available. And finally, here's the Help! 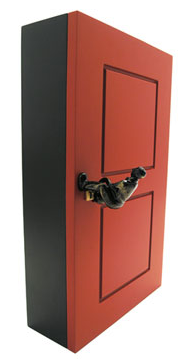 key cabinet, from Wrapables in the U.S. I'm not a feng shui expert - I call one in when I need one. But I'm aware of the general principles - at least those of one school - having read (and enjoyed) The Western Guide to Feng Shui by Terah Kathryn Collins, and Clear Your Clutter with Feng Shui, by Karen Kingston. And now I have another book I'm enjoying. 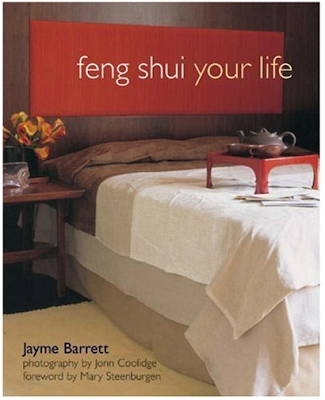 Author Jayme Barrett first mentions clutter right at the start, under Feng Shui Essentials, saying, "Clutter is one of the biggest deterrents to creating good feng shui in your life." Common Clutter: You have too much unused, unloved, unnecessary, and messy stuff littering your space. 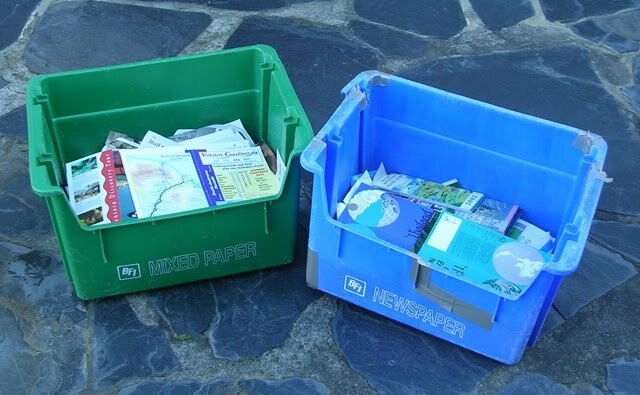 Examples include junk mail, broken objects, old newspapers and magazines. 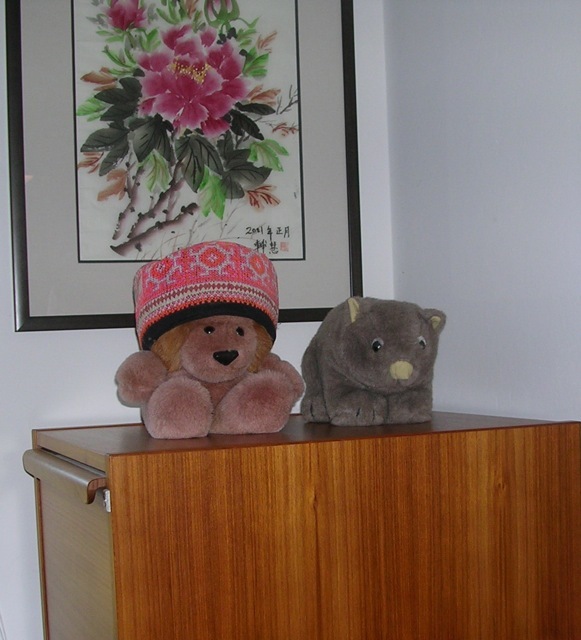 Symbolic Clutter: You have objects that consciously or unconsciously affect your emotions and thoughts in a negative way. Examples include unsuccessful projects, gloomy artwork, and disheartening books. Energy Clutter: ... Examples include photos of people who disapprove of you, gifts from past relationship, and inherited furniture you've kept out of guilt. Mental and Emotional Clutter: These are unresolved emotional issues, tasks you've been avoiding, and draining relationships. The chapter goes on to talk about the importance of a clutter-free life, reasons that clutter builds up, and steps for getting rid of that clutter. Another section of the book deals with the bagua - a map of nine energy centers that you "superimpose on the layout of a house, apartment, guest home, office, or room." 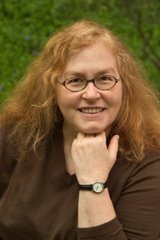 As Jayme writes about each center, she again stresses the importance of eliminating clutter; it's in her list of "no-no's" for each one. The book then goes on to provide suggestions for each room in your home: bedroom, bathroom, foyer, home office, etc. One of the many things I like about this book is that it doesn't try to dictate one right way of doing things. A number of suggestions are provided for each space, and Jayme also says, "It's better for you to love your space than to have absolutely perfect feng shui everywhere." I got this book from my library, and found I kept wanting to highlight things - so this is one of the few library books I'm going to wind up purchasing. Rooms with lots of windows can be delightful, with all that natural light, and often some inspiring views: a cityscape, a lovely yard, etc. 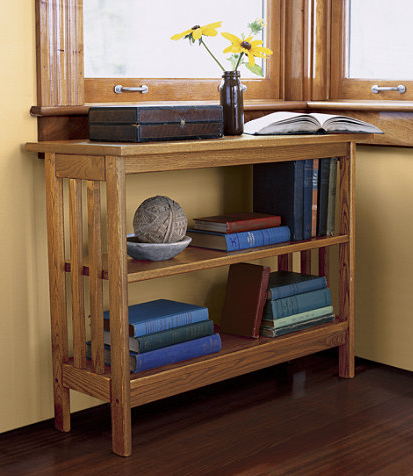 But sometimes those rooms present storage challenges - and that's when under-window bookcases can come in handy. 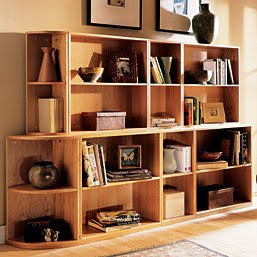 Low shelves can also be good for storing things you want younger children to be able to reach. Let's look at some options - there are many styles available - going from the shortest to the tallest. All of these would fit under the window in my home office. 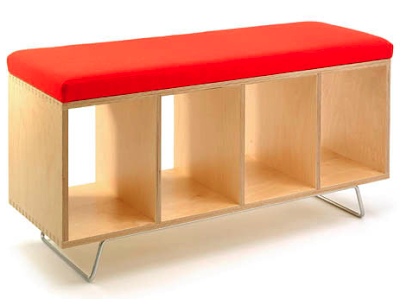 We'll start with the Offi bench box, at only 22 inches tall - 23.5 inches with the optional casters. 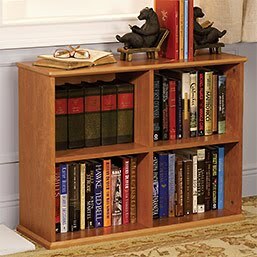 Then there's the Mission under-window bookshelf from L.L.Bean, at 24 inches tall. 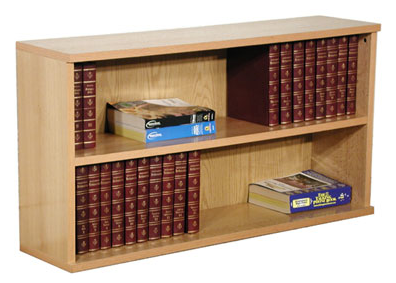 A very similar (if not identical) product is the under-window bookcase sold by Manchester Wood. Levenger's No-Room-for-a-Bookcase Bookcase is also just 24 inches tall. 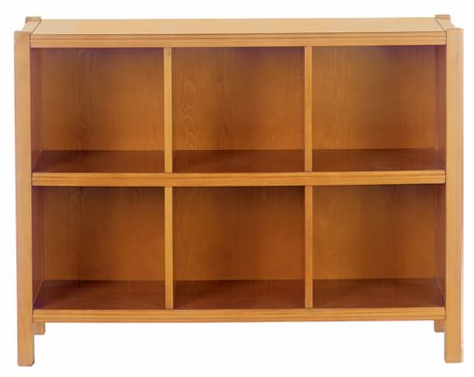 Update on April 15, 2014: Levenger no longer sells this bookcase. If you have a bit more room, there's this window bookcase from Rush Industries, which is 26 inches tall. 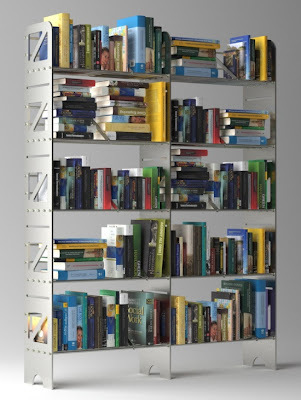 Lilly and Lolly, in Australia, is the source for this bookcase; it's 69 cm (about 27.2 inches) tall. 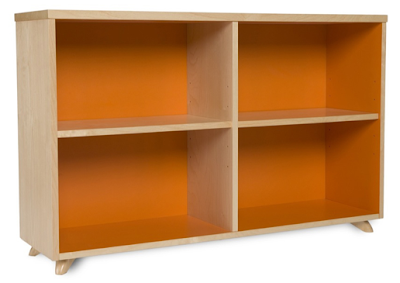 The TrueModern low bookcase is quite a bit taller - 30 inches. 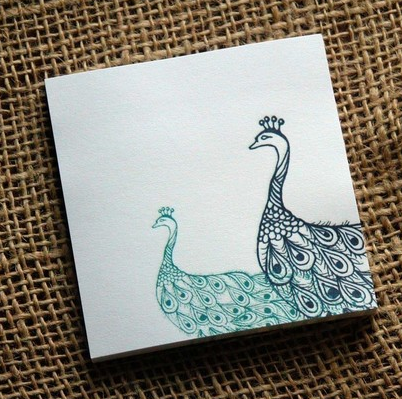 The backing comes in your choice of three colors. 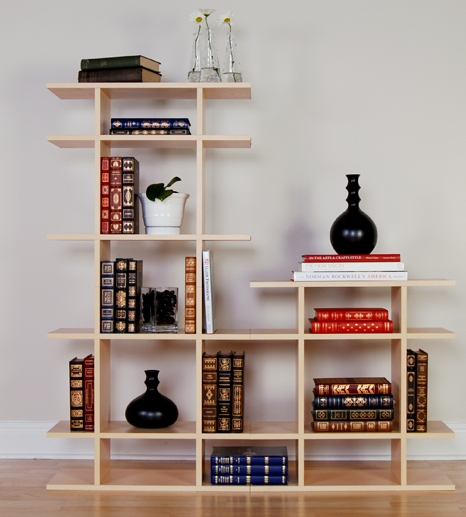 Scandinavian Designs also has a bookshelf that's 30 inches tall, available in three different wood finishes. Land of Nod has a six-cube bookcase that's 31.25 inches tall. 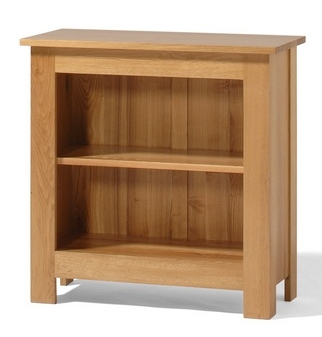 And here's a solid oak bookcase that's 800mm - about 31.5 inches - tall. 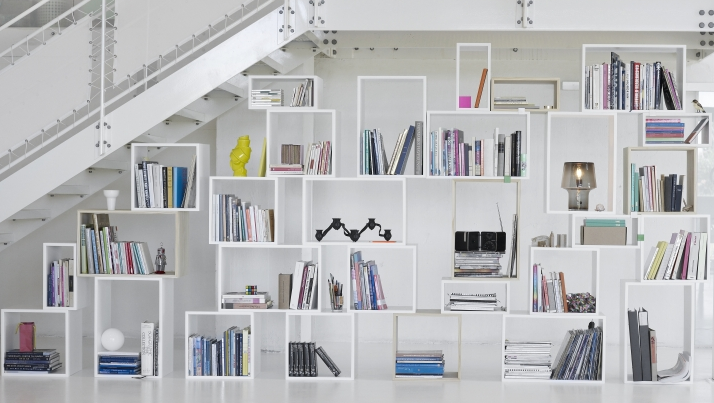 Modular shelving units might also work - more on them soon! 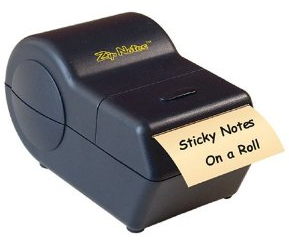 What's more boring than a plain yellow Post-it note? That's what Michelle Brusegaard asks, as she offers this alternative. She has a couple other options, too - neither of them the slightest bit boring. 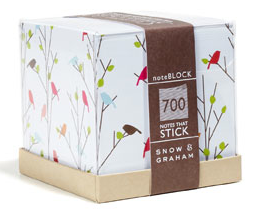 These Smock note cubes are made from 100% post-consumer recycled paper. They are "made with love in upstate New York" and there are eight patterns to choose from. Snow & Graham is another company with interesting sticky note cubes - this one is called Tweets. 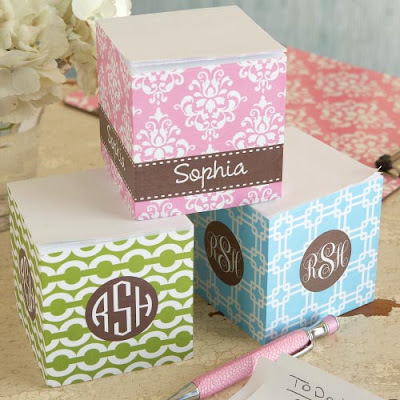 And these sticky note cubes from RSH can be personalized with your name or monogram. Update on July 24, 2013: These are Clairbella sticky note cubes — available from many sites, not just RSH. For Moleskine fans, there's now the Moleskine Stick Notes Pocket. I love to travel, and I travel independently - not on a tour. And I book my own reservations; I tend to stay at less-expensive places not handled by travel agents. So how do those of us who travel this way decide where to go? Rick Steves wrote: "Guidebooks are $15 tools for $3,000 experiences. Many otherwise smart people base the trip of a lifetime on a borrowed copy of a three-year-old guidebook." Sure, he sells guidebooks and he's a bit biased - but the point is still well-taken. I always get the most recent copy of whatever guidebooks I'm using. And for future trips, I'm looking at electronic versions of those guidebooks, when available, which I can put on my iPad. Lonely Planet has taken the smart step of selling individual chapters of its books - so if I'm going to the northwestern part of England, for example, I can buy just that part. The site also kindly tells you when the next edition of the guidebook is due. Seven days after graduating from college, I boarded a plane and landed in the middle of Greece, with little knowledge of the language, the culture or the geography. I had two months from that moment to become an expert on the country for the now-defunct Berkeley Guides; to travel to, research and write about 15 islands and nine cities and towns. ... I had to find the best hotels, campgrounds, restaurants, museums, archaeological sites, beaches and bars, as well as the prices and schedules of the ferries, trains and buses. So where else do I look? When I traveled to India, before we had all the web resources we have today, I got some of my best tips by posting my planned itinerary to the Usenet group (now Google Group) soc.culture.indian. Those groups are still available - but now I might also pose a question on Ask MetaFilter or Twitter or Quora. Benji Lanyado, writing for The Guardian, has taken "TwiTrips" - most recently to Liverpool - where he arrives with no plans and relies on the people of Twitter to guide him, step by step, to places to eat and things to see. That's not how I would use Twitter - but he does get some great advice! And then of course there are all the online review sites, such as TripAdvisor. 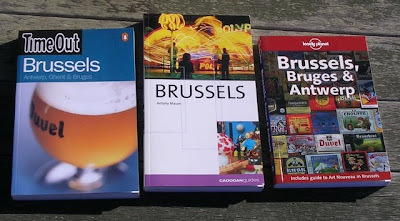 Many guidebook sites have discussion forums: Rick Steves, Fodor's, Frommer's, etc. There are all sort of travel blogs out there, too. If I have an idea where I might want to go next, I might start reading a few blogs related to that place. Or I might follow selected travel writers on Twitter. I get inspired by photos, so I'll search the web - or Flickr - for pictures of places I'm considering going. I know another trip to Paris is in my future, so I always look at Paris Daily Photo - one of a series of such City Daily Photo sites from around the world. And just plain searches, using Google or whatever your preferred search engine might be, can turn up some great things, too. When I stumble upon a web site talking about a place I might want to visit, I add it to my bookmarks. For example, I would never have visited the small Statue of Liberty in Paris if Anthony's site hadn't directed me there; I bookmarked it years before I went there. And here's a place I may well want to visit the next time I'm in Paris. And then, of course, there's the advice from people I know: people who have visited the place, or people who live there. Those people often provide the best tips of all! Do I check all these resources for every trip? No - but it's sure nice to have so many good options available. Do you have any favorite travel planning resources? If so, please share! 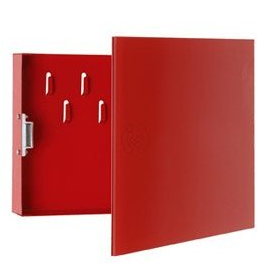 See this lovely file cabinet? It's mine - and until yesterday, it was entirely filled with travel-related files. All four drawers. Well, I do enjoy traveling, and at one point - before we had such easy access to information on the web - it even made some sense. But now? Almost anything I want to know I can find online. And some things I can't find online can be scanned, so I don't need to save the paper. I knew this was an area needing some attention - but it didn't bother me until recently, when I really wanted to use that filing space for something else. So yesterday I began the clearing out. The old train schedules from England, the old restaurant recommendations for places around the world, the glossy promotional literature from Singapore and Spain and Thailand - that's all in the recycling bins now, along with much more. And I have a free drawer - with more space to come, because this project isn't yet finished.